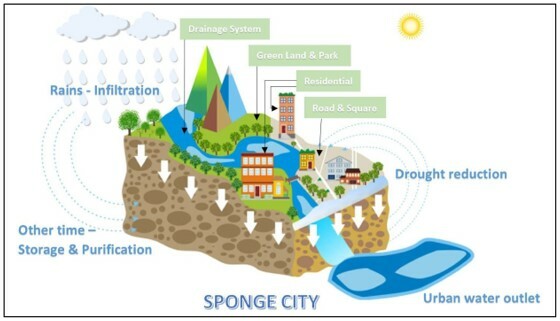 Home /China, Environment, Water crisis, Water security/The opportunities and challenges of the sponge city project in Chinese cities – the solution of urban flood and drought issues? Since the “Open Door Policy” was established in the late 1970s in the People’s Republic of China (PRC), many Chinese cities have experienced unprecedented development and urbanization. The urban population has climbed some four-fold compared with the 1978 in 2015. Such a large urban population is essential to support high-flying industrial and commercial developments. For example, Shenzhen is a typical case that the population has increased more than 30 times between 1979 to 2015. In such fast process of urbanization, land-use change from natural landscape (e.g. green spaces, vegetation areas, forestry and soil surfaces) to urban areas (e.g. roads, building and infrastructures) has been occurred. Cities in the Pearl River Delta recorded about 26.3% land-use change from the green areas (including forest, grassland and vegetated farms) to urban areas from 1979 to 2000s. Similarly, the green spaces and surface water-bodies has been lost at 10.4% across 16 cities in the Yangtze River Delta. Many Chinese cities have been lost many permeable surfaces (e.g. soil surface, grasslands, vegetated areas, etc.) that allows storm water (or rainwater) infiltration all of sudden. As a result, the retention capacity for storm water is lower and causing lesser recharge of underlying groundwater (that affects cities where still rely on groundwater as for the urban water resources). On the other hand, most Chinese cities is over-relying on the urban drainage systems, especially during the wet season when the most intensive rainstorm occurs. 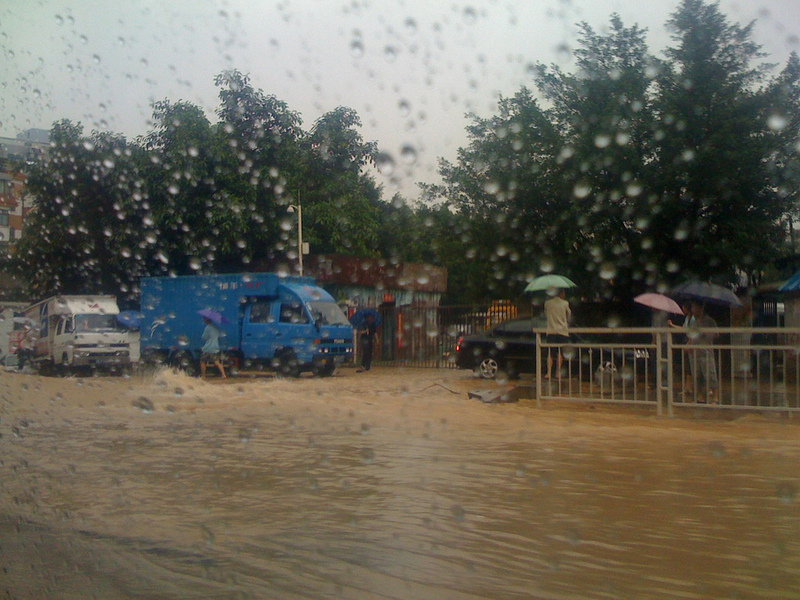 However, unfortunately, most of the Chinese cities at the moment are only able to withstand the runoff at 1:1-year rainstorm, which means the current land drainage system is weak that should be only withstand the rainstorm equivalent at about 187mm/24 hours, thus a number of cities have suffered recurrent flooding as their outdated drainage systems cannot cope with the intensity of typhoon/cyclonic-enhanced rainstorms and sub-tropical rainstorms. Several severe urban flooding events have been occurred in the recent years in different Chinese cities, such as in Beijing (2012), Wuhan (2016), Ningbo (2013), Guangzhou (2010), Shenzhen (2013) that have been caused enormous economic lost (e.g. properties damages), injuries and casualties (78 deaths in Beijing flood 2012). (iii) to integrate natural water-bodies (such as wetlands and lakes) and encourage multi-functional objectives within drainage design (such as enhancing ecosystem services) whilst providing additional artificial water bodies and green spaces to provide higher amenity value and prepare for drought period (that enable reuse the stored purified water by the sponge works). For example, common sponge practices that using bio-swales, rain gardens, pervious pavements, artificial ponds and green roofs are often designed to mimic natural hydrological response (for example these measures are able to reduce the peak discharges in urban runoff land drainage system) and to absorb urban storm water through soil infiltration, storm water retention, storage, purification, recharge groundwater and improving water quality of the runoff (Figure 1). In fact, these sponge infrastructures (e.g. swales, artificial pond, etc. ), can also increase the overall area of urban blue-green spaces in Chinese cities. This in-turn can improve urban eco-system diversity by providing new habitats for a wider range of organisms (e.g. birds, butterflies and dragonflies, etc.) particularly beneficial to areas that have been intensively urbanised. Careful planning of these sponge infrastructures can also deliver multiple benefits to the general public by creating more recreational space (e.g. 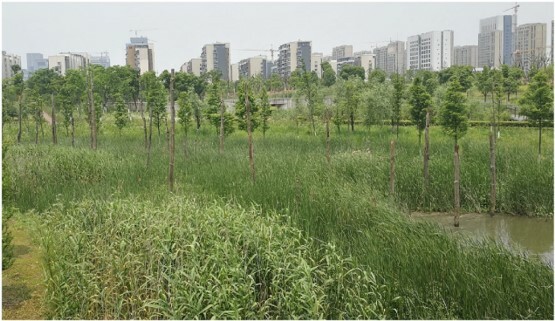 urban parklands), improving the amenity value and the living well-being of a district, for example one of the pilot sponge site at Jiangbei, Ningbo is located in the urban park where provides the public for recreation, but also able to store storm water from surrounding areas during the rainstorms (Figure 2). However, the cost of building these sponge infrastructures are generally at rather wide range, but not cheap, the cost ranges from about 200 RMB/m2 (£3.5/m2) to 1,200 RMB (£140/m2). The central government is supporting all 30 sponge city pilot cities RMB 600 million/year from 2015-2018 to complete the 1st stage pilot projects. The challenge is obviously the next targets of the sponge city program, which is increasing the sponge areas (in these pilot cities) by approximately 20%, and to retain about 70% urban storm water by 2020; and ultimately targeting further reuse up to 80% of storm water by 2030s. In fact, the Central government planned to fund only 15-20% for the next stages in the program. The challenge remains with how the municipal government to finance these sponge projects that should establish a better investment mechanism with private sector (e.g. investors, developers, banks, etc. ), including tax incentives, better project transparency, and looser credit markets to attract further Public-Private Partnership (PPP). In conclusion, that certainly is good news to address urban water problems to collect more storm water for relieving urban floods, but also purifying these precious water resources for preparing water storage and drought issues, we still need time to wait and see the effects and performances of the program. Undoubtably most of Chinese cities has been intensively urbanised in the last few decades, promoting the sponge program could be a good opportunity not only to address the urban water issues, but also taken some steps forward on improving the urban living environments. Faith Chan is Assistant Professor, School of Geographical Sciences, University of Nottingham Ningbo, China. 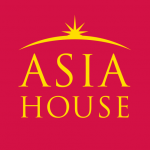 He specialises in sustainable flood risk management, climate adaptations and urban resilience on Asian coastal megacities. Image credit: CC by Chase Chesser/Wikimedia Commons.